Depending on your broker, ECN pre-market trading starts as early as 4am EST. The ‘normal’ access pre-market then starts at 8am EST., as which point more liquidity and volume comes into the market, until the official market trading open at 9:30am EST. Pre-market trading is only accessible through ECNs and dark pools, just like the after hours session. Although there are no market makers or specialists posting quotes in the pre-market, they may actually be participating through ECNs in preparation for the impending regular market trading session commencing at 9:30am EST. The pre-market session can be less riskier than the after hours session as the action continues into the regular market session at 9:30am EST., which allows the trader to at least be able to trade in and out of the position. 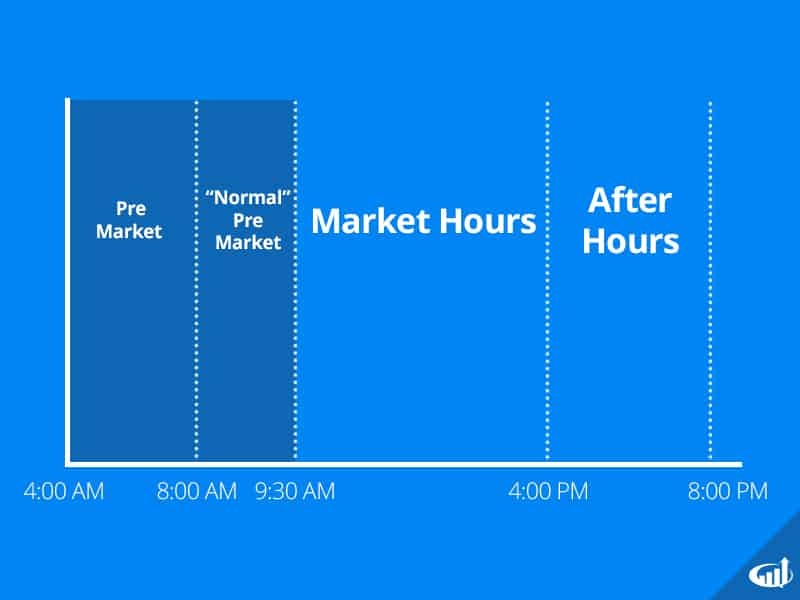 Since after hours trading ends at 8pm EST., it can trap many traders into a position, which they have no control over until the pre-market session resumes 8-10 hours later. More importantly, the resumption of trading could start off with a sharp gap against the trader’s position. Again, the pre-market trading is always less liquidity that regular market hours trading due the absence of market makers and specialists. The liquidity is usually greater than after hours trading since pre-market continues right into the regular trading session. Participants aware of the gap up or down are preparing for the market open so liquidity instantly rises as it get closer to the market open. Maximum liquidity comes into after the open. Pre-market is a period where participants are jockeying for position. After a company completes its conference call, analysts will often present any changes in their recommendations the morning after. Depending on the analyst(s) actions, this can have a material impact on the price action of reporting company’s shares. Firms with more clout tend to have larger impacts (IE: Goldman Sachs, Morgan Stanley, Bank of America/Merrill Lynch). While the analyst’s reports have an initial impact, the lasting effects may be different depending on the sentiment reflected in price action. Pre-market is the best time to chart trend lines and Fibonacci retracement levels since the price is closer to what the regular market hours trading will entail. Many times the after hours trading range can be completely different than the trading range the next day as more participants come into the market. Just like after hours trading, pre-market trades can only be executed with limit orders through ECNs or dark pools. It is highly recommended to use a direct access broker to facilitate trades to ensure liquidity through proper routing. Trades can be made based on support/resistance trend lines, patterns and or momentum indicators. The S&P 500 futures can also affect a stock’s gap up or down even without news. Only seasoned veteran traders should partake in the pre-market. Keep in mind that the pre-market price range and trend can reverse as soon as the market opens. The worst situation is getting trapped in a position that backfires ferociously on the open and freezing up like a proverbial deer in the headlights. With stocks that are gapping up or down, there is often a backlog of stop orders ready to trigger on the open, which can result in a tidal wave of momentum against an existing position. It is prudent to close out positions prior to the open.